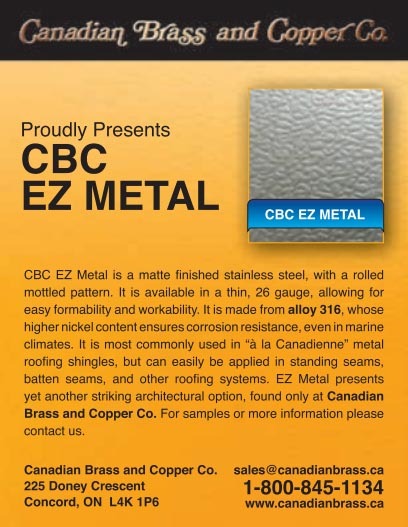 CBC EZ Metal is a matte finished stainless steel, with a rolled mottled pattern. It is available in a thin, 26 gauge, allowing for easy formability and workability. It is made from alloy 316, whose higher nickel content ensures corrosion resistance, even in marine climates. It is most commonly used in “à la Canadienne” metal roofing shingles, but can easily be applied in standing seams, batten seams, and other roofing systems. EZ Metal presents yet another striking architectural option, found only at CBC Specialty Metals. Custom sheet sizes are available for orders larger than 3000 square feet.